In her youth the doors to the shrine of Elena’s heart were wide open for all to see. Some kept their hearts in private spaces, secret and hidden, but not Elena. She kept hers in the front room, because what good is a bright heart if it can’t be shared? Every morning she polished the shrine, and dressed her heart with fresh flowers that filled the air with the scent of jasmine and violet. She hung small crystals that caught her heart’s light and refracted it into every color, filling the room with rainbows. On the wall above her heart Elena kept her collection of smiles. Smiles for celebrations, for sunrises and sunsets, for soft sheets and warm limbs, for surprise and wonder at her extraordinary good fortune. It was an impractical placement; it would make more sense to store them near her vanity, but she liked having them out where visitors could appreciate them and where she could select exactly the right one at the last minute, before she walked out the door. As the years passed, jasmine was replaced by roses; sparkling crystals made way for quiet pearls. Her collection grew to include the shy but elated smile of her wedding day, the contented smile that she wore on waking beside her love every morning, and the proud smile she wore for their silver anniversary. But all things end, even when we don’t believe they possibly can. Elena smashed them all, crushed them beneath her feet and then sat on the cold floor among the shards as the day’s light crept across the room and disappeared, and the light in her heart went with it. The flowers died and were cleared away. The doors of the shrine remained shut tight, opened only on the first Sunday of every month, to dust and keep it tidy, for the sake of good housekeeping. In the right light the outlines of smiling faces could still be seen on the walls, faded scars of old wounds that time would never fully erase. One cannot go naked into the world, and so Elena eventually settled on a new face, one with a slight furrow in the brow and a subtle downturn at the corners of the mouth–an expression not so deep as to give offense, she felt, but one that conveyed a necessary distance between herself and the world. After some consideration she also bought a new smile, thin and pale, to wear if the occasion should call for it. None ever had. Behind painted black shutters her heart beat out the years in the dark, a slow and measured rhythm, unchanging and unnoticed. Until she met Ivy, on a February day that threatened rain: a day for a practical coat, shoes with a good grip, and an umbrella, all absent from the woman who shrieked and laughed as the sky let go. Her silver hair hung in wet twists that matched her silver shoes, in which she splashed through the puddles with the abandon of a child, or a fool. The hibiscus-bright smile she wore was altogether too forward, a face meant for a younger woman and a different season–not a proper February face at all. Elena’s route to the bakery was fixed, the same every day, rain or shine, her feet grinding out a prayer for stasis, for safety from change and the pain that comes with it. To reach the walking path that circumscribed the park she would have to walk directly past the madwoman making a spectacle of herself. The sky began to drizzle, and then to pour. She opened her sturdy black umbrella, kept her gaze straight ahead, her chin up, and strode with purpose toward her goal. Isn’t it wonderful? the woman said as she approached, startling Elena to a halt. Elena could think of nothing to say except, You’ll catch your death, and held the umbrella in such a way as to shelter them both, for all the good it would do. Nonsense! the dripping woman laughed. Rain washes away the dust. It waters the flowers, and makes things grow. They watched the sky fall until the cloudburst had spent itself and the clouds parted, spilling a few golden rays of afternoon light down through the gloom. Elena folded her umbrella and walked on. I’ve seen you, the woman called after her, and moments later she was at Elena’s side. I see you walking at the same time every day. I’m Ivy, the woman said, tilting her too-bright smile toward Elena and wringing rainwater from her hair with brown hands as wizened as her own. Elena, she replied. My name is Elena. I’m so happy to meet you. We should walk together sometime, and take tea. All right, she agreed through her frown without fully understanding why. Back in her rooms, Elena’s shuttered heart grew warm. Elena walked the mile to Ivy’s apartment in her sensible shoes, her porcelain frown freshly polished and her coat brushed down. She stiffly climbed the narrow stairs, pausing half-way up to catch her breath and rest her aching hip. Ivy greeted her at the door, almost always with a new smile–she never seemed to wear the same one twice–and would not rest until she saw to it that Elena was seated in the most comfortable chair with an aromatic cup of something hot in her hands. Ivy’s rooms were warm, and smelled of citrus; her tea cups were chipped and no two of them matched; her walls were covered in art of all kinds, from black ink doodles on butcher paper held up with thumb tacks to still-life paintings painstakingly rendered in oils and hung in carved and gilded frames. Ivy’s rooms were a refuge from order, from silence. Barefoot Ivy would move around the room, telling stories, or listening rapt when she could persuade Elena to tell her own. She played her favorite pieces on the upright piano, thick with dust but in perfect tune, and sang in a voice that was charmingly off-key. Elena only realized the time by the fading light through the window, and then her offers to help with the dishes were rebuffed; Ivy sent her off with a small bag of sweets and a cheerful admonition to be careful walking home. Once home, Elena would put away her coat, hang her face by the door, and sit in a straight-backed chair by the window—looking out at nothing in particular, counting the days—until Wednesday would come again. On this particular Wednesday Elena left her face on the wall while she dressed in front of the mirror, and she thought of Ivy. Brilliant Ivy, shining Ivy, Ivy who wore a dozen smiles, each more beautiful than the last. Smiles that lit her eyes, smiles that showed her teeth. Ivy whose slender fingers could still play a concerto like a woman half her age, and made her tea so strong that Elena had to cut it with extra milk. Ivy, whose heart shrine’s doors hung half-open in the corner, their chipped paint a faded rusty orange that might once have been red. Secretly Elena hoped for a gust of wind through the open window, or an accidental bump that might cause them to swing open. Sometimes when Ivy was out of the room to put the kettle on or find the jam (which never seemed to be in the same place twice) Elena was tempted to sneak a look inside, but to do so would be hopelessly rude. She was embarrassed and ashamed of her curiosity, this desire to invade her friend’s privacy. The temptation was strong, though, and driven at least partly by concern: for all her smiles and songs and stories, behind the doors of Ivy’s half-open heart shrine, Elena could see no light. Dear, she would say, your shutters are ajar. She found the periwinkle suit at the back of the closet, mercifully free of moth holes. She could not recall the last time she’d worn it, or anything else that wasn’t a sober neutral. But today called for something brighter, something softer, because spring had come. Elena studied the suit, wondering if it was hopelessly out of fashion and she would look a fool for wearing it, but reassured herself that certain lines were timeless, and it was appropriate to the season. It still fit, she was relieved (and not a little proud) to find, though she struggled to reach the zipper in the back, and it hurt her fingers to grasp it. On a whim she opened a long-neglected drawer and rummaged through it until she found what she was looking for: a brooch of deep green enamel leaves and tiny seed pearls that hung in a cluster, crafted to mimic the droop and drape of wisteria blossoms. She thought that Ivy might like it. She wondered what her favorite flower was, and her favorite color–why had she never thought to ask? In the front room she lingered and considered her smile, dusty from disuse. She could not recall ever wearing it. It would surely feel unnatural, ostentatious; in fact, what was she thinking, all dolled up and glittering like a girl? It was embarrassing. It was much too late to change her clothes—Ivy would be waiting—but at least she would not walk about covered in ornaments like a holiday tree. She unhooked the brooch and set it on the table by the door. The black shutters over her heart caught her eye, severe and unwelcoming. She would have to give it a good dusting, and perhaps a coat of paint soon. And it wouldn’t do her any harm to let some light in there. Plenty of women her age left their hearts open. Satisfied with this decision and now running terribly late, she pulled her frown from the wall—her February face, as Ivy had once called it—and put it on, smoothed her hair, and left the house. Moments later she returned and retrieved the brooch. She felt certain that Ivy would like it. The walk to Ivy’s apartment seemed particularly long that day, despite the sunshine and new blooms. It was a Wednesday like any other, but something had changed, something that welled up inside her and threatened to choke her if she didn’t let it out, something that needed to be said or done. As Elena climbed the stairs she was seized by the irrational fear that when the door opened she would be unable to speak, that she had left her voice among the shards of her smiles all those years ago. She felt overdressed, affected, abashed. She fingered the brooch nervously at her chest, toying with the clasp, ready to pluck it from her coat and secret it away. Ivy answered the door wearing her joie de vive smile and laughed in delight, her fingers grazing Elena’s own. Look at you! You look lovely, she said. You’ve brought Spring with you today. I have something for you, Elena said, her fingers fumbling with the pin before she managed to unhook the clasp. Pain like a knife shot through her jaw and ran up along her hairline, where the edges of her frown met delicate skin. She gasped in surprise, and brought her hand to her face, trying to find the source as it stabbed through her again. What’s the matter? Are you all right? Ivy asked as she reached out to steady her, but Elena backed away in fear and confusion, her vision blurry with tears. You’re bleeding! Elena’s fingertips came away red with blood, and the pain came again, and then pressure, so much pressure she felt as if she were being crushed beneath the porcelain of her face. It’s nothing, I’m sure, she said. But I don’t feel well. I should go. She found the door and waved Ivy off, insisting that she would be fine. She left in haste, Ivy protesting behind her. It was tight, so tight. The face she’d worn all these years now gripped her cruelly. By the time she reached her door she was out of breath and half-blind from pain. Alone in her bedroom she sat in front of her mirror and ran her fingertips gingerly around the edges of her frown, near the hairline where the porcelain brow furrowed just a little; behind the severe angle of the cheekbones; under her chin, where the painted mouth drew down at the corners. She could see now where it cut into her flesh, rivulets of blood tracing a line down her jaw. It came away with difficulty, and beneath it the blood was drying to a sticky brown; her smooth, featureless flesh was pinched and bruised, the area around her lipless mouth mottled and red. It smarted still. The natural lines and folds that came with age were temporarily filled by the swelling, a grotesque reversal of time. Her reflection was that of another woman, the victim of some tragic accident, unrecognizable. But she was surely still the same Elena who had earlier put on the dress that she now struggled out of—the same Elena who had donned the ivory slip that now pooled around her feet; still the same Elena who had so carefully arranged the hair that now fell in thin, loose waves as she pulled the pins from it. She stood before the full-length mirror in which she had earlier checked the straightness of her stockings, her body as naked as her poor bruised face, and wondered what Ivy would say if she could see her now. The east wall was empty, the ill-fitting frown discarded. She sat in the straight-backed chair again, wrapped in a soft blanket which she hugged tight around herself. Her face was bare of all but the ointment she had applied to her injuries. She watched the moon rise through the parlor window, moonlight tracing its way across the floor, over the scratches still visible in the wood, where the shards had bit so long ago. She remembered the woman she was a lifetime ago, a woman of smiles and refracted light. When the knock at the door came, she did not move to answer; she did not turn when the door opened and footsteps could be heard on the floor. And then Ivy’s soft arms were around her, her porcelain cheek resting on Elena’s shoulder. I was worried, Ivy said. It didn’t fit anymore, Elena explained, embarrassed for reasons she couldn’t identify. Ivy said only, I know. Elena turned in her chair to face her. Ivy kneeled before her, oblivious to the cold, hard floor. She ran her fingertips over Elena’s bare face, dancing around her eyes, stroking her cheek, carefully avoiding her injuries. Elena was surprised at her own boldness as she reached out as well, her fingers tracing the hard edge of Ivy’s smile, following the lines, and though Ivy’s breath grew short she did not pull away. It came off easily, the sweet, satisfied smile that she wore. Beneath it Ivy’s tender flesh was bruised and abraded, her skin mottled and lined with scars—some were fresh and bright, barely healed, while others had faded away, leaving only the ghosts of past pain. Elena thought of the darkness inside those half-opened doors in Ivy’s rooms. They don’t fit, Ivy said. They never have. But it’s what people want to see. So what if it chafes a little? She shrugged. I have always envied you. You’ve never worn a false face. Elena studied the face in her hands, the deftly sculpted dimples and flawless strokes of rose, the slight crinkle around the eyes that made a person believe that this smile was for them and them alone. She lifted it to her own face, and was unsurprised to discover that it fit perfectly, almost as if it weren’t even there. But Ivy pulled it from her, tossing it aside, and then she stood, her hands outstretched and beckoning. Elena rose too, the blanket falling from her shoulders. The room grew brighter with their embrace, as light streamed out between the slats of her shrine’s closed shutters. Elsewhere, in warm rooms that smelled of citrus, the doors of a neglected heart stood wide open, and February faces began to gather dust. 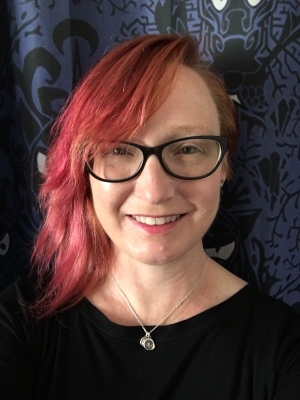 Christie Yant writes and edits science fiction and fantasy on the central coast of California, where she lives with a dancer, an editor, two dogs, two cats, and a very small manticore. Her stories have appeared in anthologies and magazines including Year’s Best Science Fiction & Fantasy 2011 (Horton), Armored, Analog Science Fiction & Fact, Beneath Ceaseless Skies, io9, Wired.com, and Science Fiction World. She is presently hard at work on a historical fantasy novel set in 19th century Paris, and is learning more about architecture and urban planning than she ever thought she would need to know.